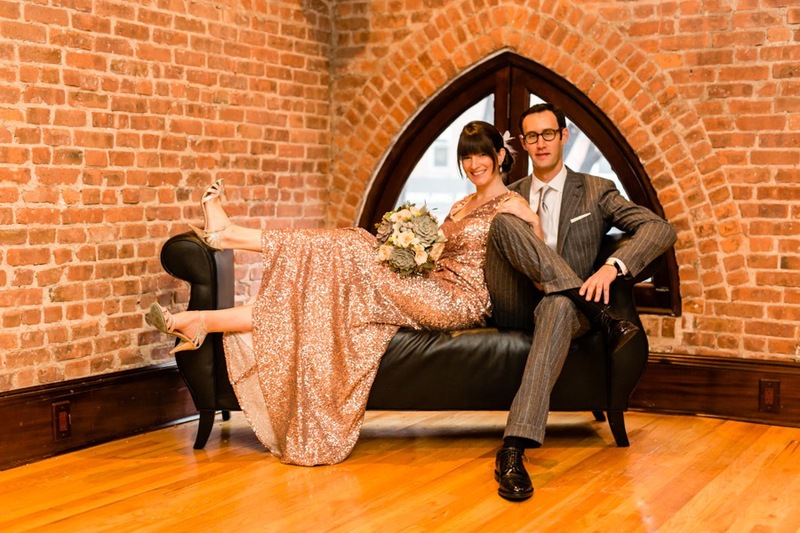 Beth Nagalski (34 and an attorney) and David Cooperstein (33 and an attorney) planned a fun, rustic affair with vintage flair at Deity in Brooklyn, NY. The repurposed, 150-year-old synagogue offered the ultimate location for the event, with its abundance of local artwork and distinctive event spaces on three different floors. 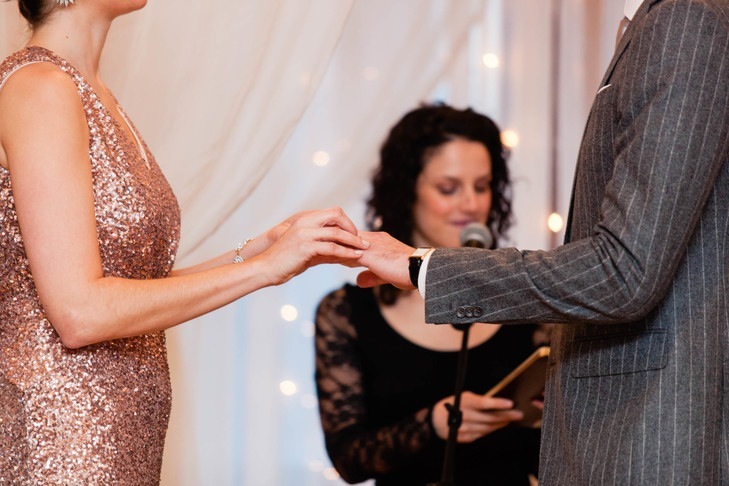 “The ceremony and dinner were in the loft on the top floor, the cocktail hour in a lounge on the middle floor and finally we moved into the basement for a dance party,” says Beth. Beth and David’s winter wedding called for something a little different when it came to the florals, with many classic varieties being out of season. For Beth’s bouquet, Opalia Flowers put together a stunning arrangement of succulents, brunia berries, dusty miller, seeded eucalyptus and a few blush roses that fused modern and classic styles, while playing up the winter season. With an anything-but-average Badgley Mischka gown taking the place of a classic white dress, Beth knew her accessories had to be just as fabulous. 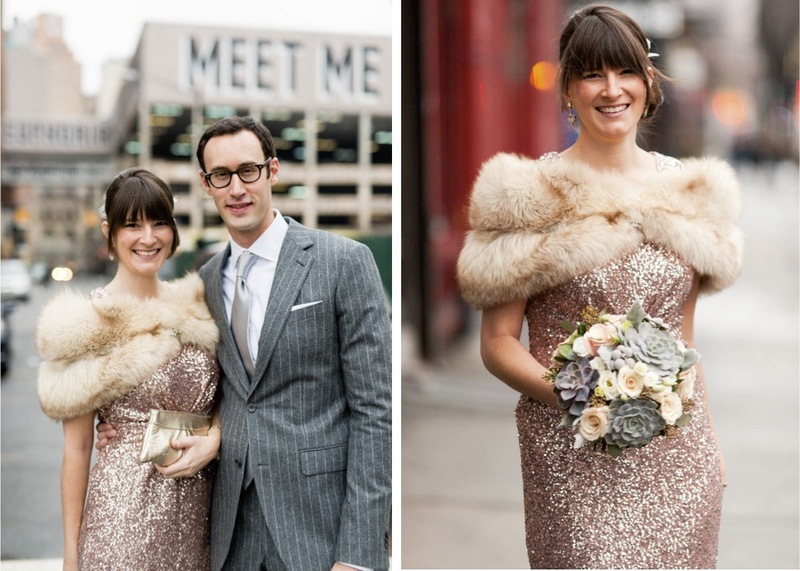 Instead of a traditional veil, she added a feathery hairpiece to her classic updo and completed her look with a vintage fur wrap. At 6 foot 6 inches, finding a suit that could work with his height proved to be a bit of a challenge for David. 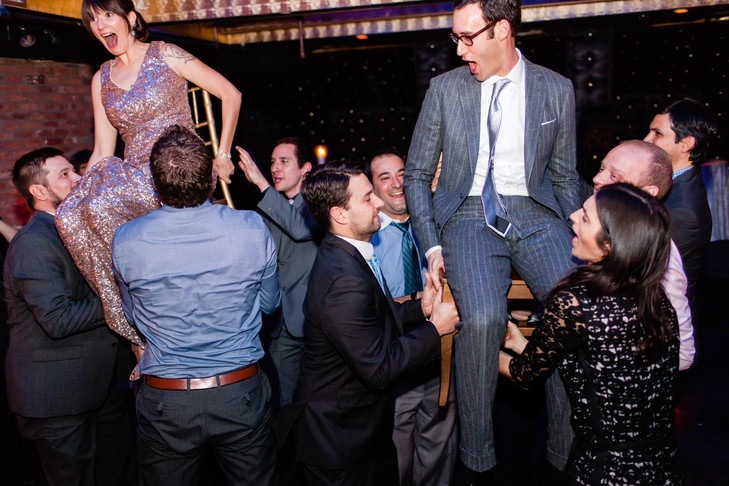 Instead of buying off-the-rack, he enlisted the help of Evan DeLaney, a bespoke tailor in Colorado Springs, Colo., who created a custom suit for the wedding with gray pinstripe fabric. He paired the look with a silver tie, white button-down shirt and a sleek white pocket square. 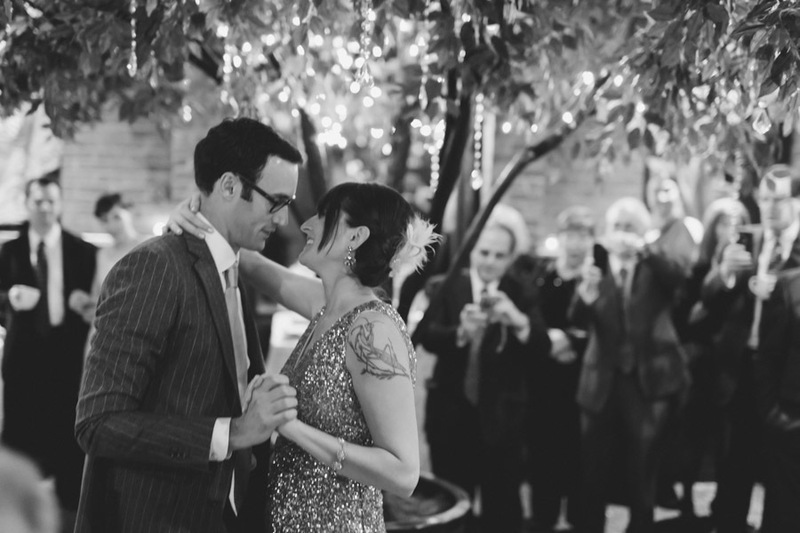 After Beth and David exchanged vows in a ceremony in Deity’s top-floor loft officiated by their close friend — the very one that introduced the two — the newlyweds whisked their guests off to Deity’s second floor lounge for cocktail hour. The band Padam Swing kicked off the nights festivities with gypsy swing tunes and got guests in the mood to party. The couple filled the historic venue with unique, personal touches like terrarium centerpieces with playful scenes of the couple hiking and biking, two of Beth and David’s favorite activities, a robot cake topper and a heritage table with family wedding photos displayed in vintage bottles. “I love moss and terrariums and hate how wedding flowers just get thrown away,” says Beth, “so we had terrariums as centerpieces that people could take home afterwards.” A close friend, the very same one that introduced the two, officiated the ceremony and Beth and David exchanged vows they’d written themselves, as well as one they’d each written for each other. 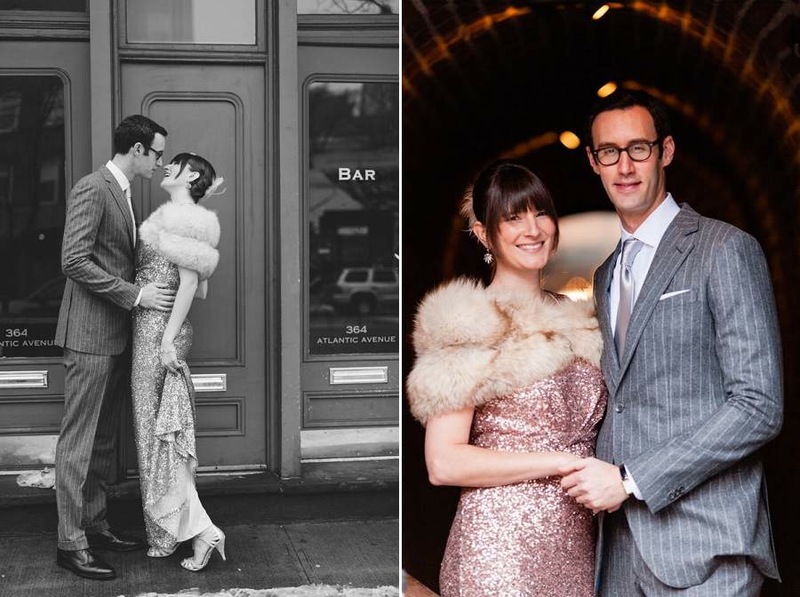 New twists on wedding traditions offered another personal element to the winter wedding, like Beth’s glam, sequined Badgley Mischka gown and a tower of decadent doughnuts from local icon, Peter Pan Donut and Pastry Shop. 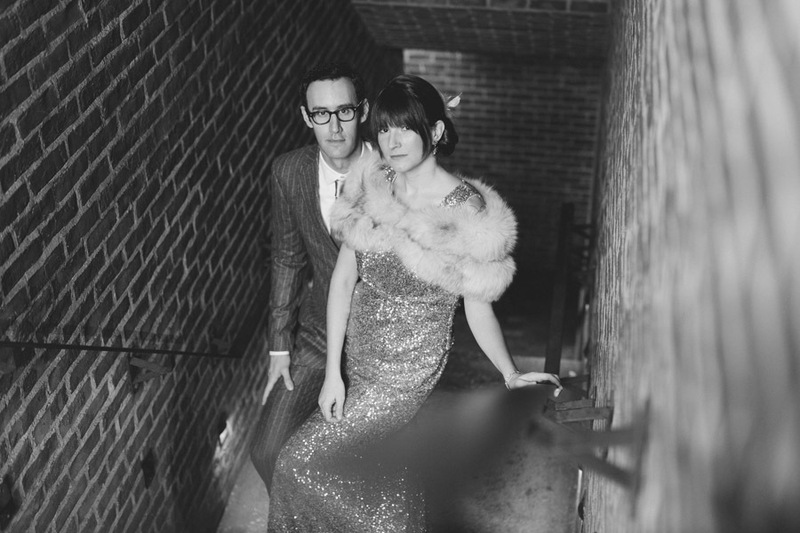 A “gypsy jazz” band provided a lively soundtrack for cocktail hour and after dinner the newlyweds hosted a dance party of epic proportions in the Deity Cellar, an exposed brick subterranean space with a gold coffered ceiling. Located only a block away from their apartment in Brooklyn, NY, Deity offered the ultimate location for the couple’s eclectic, vintage affair. The 150-year-old former synagogue was transformed into a unique, modern venue in the early 2000s filled with artwork, stained glass and light fixtures from local artists. 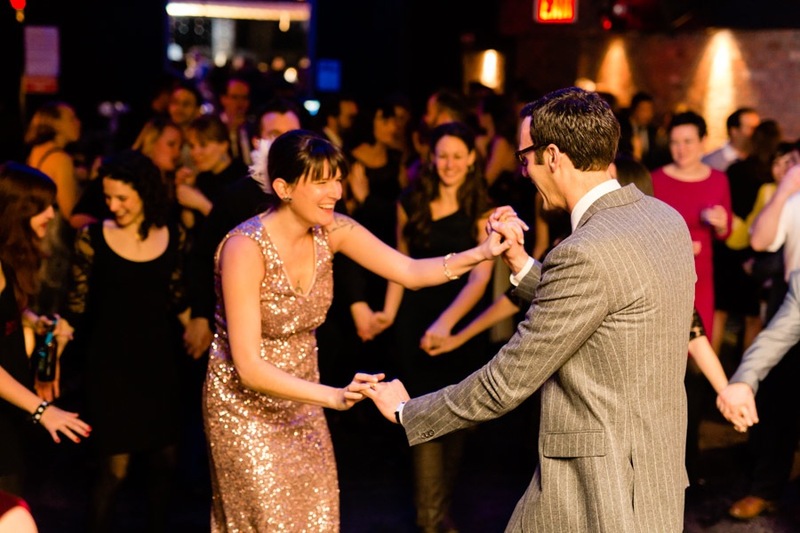 The couple made use of all three of the venue’s distinctive floors, hosting the each portion of the day on a different level. 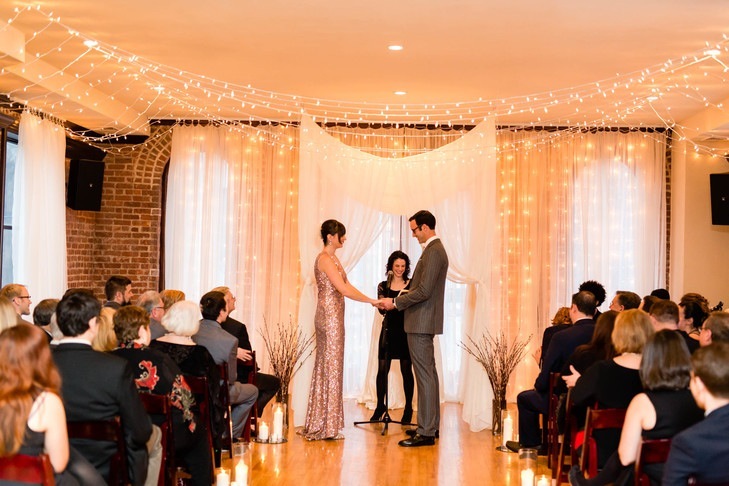 “The ceremony and dinner were in the loft on the top floor, the cocktail hour in a lounge on the middle floor and finally we moved into the basement for a dance party,” says Beth.